A friend told me the other night that her mother voted for Ronald Reagan over Jimmy Carter in the 1980 presidential elections because she thought Roslyn Carter looked uptight, whereas Nancy Reagan seemed much more appealing. I think that many folks find this voting model appealing, even if not consciously, and I wonder why. A similar logic has become the basis of a popular college-application question: Who would you most like to have dinner with, and why? Eager college applicants (myself included) choose unusual famous figures who will somehow reflect how impressive the essay-writer really is. Applicant gets accepted to her favorite college and somehow internalizes the logic: namely that the famous figure with whom she wants to have dinner reflects something admirable about herself. I ended my previous post by pointing out that people will believe whatever you tell them you are, even if that self-representation is, let’s say, less than completely precise. That’s not such a bad thing in most areas of our lives. We all have certain versions of ourselves that we’d prefer that people see. When folks do see our preferred versions of ourselves, we make them our friends and lovers. When they see us differently from our preferred self-representations, we fight, reconcile, forgive or break up with those friends. And we also have tendencies to change or want to change our self-representations. This is why it was so popular to “go west, young man.” If you wanted to “remake” yourself, you moved to a new place with a new version of yourself and made new friends (it’s also why totalized surveillance in the form of FBI databases and CIA fusion centers are problematic—but that’s for another post). 1. We tend to be friends with folks because we like their self-representations. But we’re not necessarily harmed when they change their self-representations, in large part because their actions probably don’t have an immediate impact on us. So, if I have a friend who was pro-union in college but becomes a union-busting lobbyist afterward, I may not respect her for it, but I can probably live with it–as long as we never discuss her work. Depending upon the nature of our friendship, I might take up the option of calling her out on it, discussing, reconciling, disagreeing, or ultimately ending the friendship because I am so troubled by her vocation (Yes, I know that Aristotle wrote about different types of friendship). But the consequences can be managed, at least at a personal level. 2. We think well of our friends, and can even imagine supporting them for office because we like and support who (we think) they are. But in most cases, we’re not called upon to do so, because for most of us, our friends don’t run for office. And we may like/deal with friends whose principles are odds for us, but we don’t have support them financially, work on their campaigns, or vote for them. We can even withdraw our support for family members whose politics we disagree with. See for example, Candace Gingrich-Jones on her brother, Newt. 3. The opposite conclusion is more problematic: voting for someone because we like their self-representations, or because we can imagine them being our friends. The image that they project may not (usually is not) accurate (more on this below). The effects of voting for someone whose self-representation is inaccurate/misleading/deceptive could lead to widespread and disastrous results for many more folks than just myself. Of course, it could have a happy opposite effect, but I can’t think of any examples. On the accuracy of public self-representations: Walter Benjamin has a brilliant essay, “The Work of Art in the Age of Mechanical Reproduction.” There are many insights to be gleaned from this piece, written in 1936. Benjamin points out how the invention of the camera enables a forum that influences, even prescribes, how a true emotion is reflected publicly. The “authenticity” of the emotion, which we might otherwise ascribe through our myriad interactions with a person, can now be extracted through the trust of the camera. 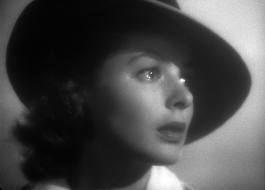 At the end of Casablanca, we get a 3 second screen shot of Ingrid Bergman’s eyes filled with tears as Humphrey Bogart assures her that they’ll always have Paris. 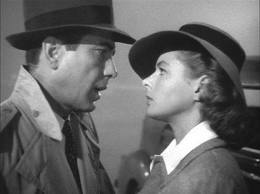 We know that this means their love was true, their love was lost, and Bergman’s heart is broken. As Benjamin notes so wisely, “This permits the audience to take the position of a critic, without experiencing any personal contact with the actor. The audience’s identification with the actor is really an identification with the camera.” (Benjamin 1936, VIII). Can Ingrid really be sad if her eyes aren’t filled with tears? Can Bogey really be heartbroken if he’s not drowning his sorrows in whiskey? Judgments about the moral stature of a person (in the public eye) are suspect to begin with, especially if they’re based on physical features, fashion sense, or weight (think about the snarky comments about New Jersey governor Chris Christie when he was reported to consider running for president). But he’s also one of the few politicos who nominated (AND defended) the appointment of a South Asian Muslim lawyer to the New Jersey Superior Court. On political judgments based on public persona: What does a charming smile, gentle temperament, or well-modulated voice tell us about a person’s political convictions? President Lyndon B. Johnson managed to push through some pretty decent civil rights and affirmative action legislation, rough redneck though he was. On the other hand, his foreign policy decisions left much to be desired. But his personality didn’t necessarily reveal that much except he was an interesting character to quote in newspaper articles. On the political character of a candidate based on their spouse: Yes, I too was enamored of Michelle Obama. I love (what I think) I see of her character, her accomplishments, her ideas (those that were publicly aired), her beauty. But her public persona tells us very little about her spouse’s political judgments and capacities. It doesn’t even tell us that much about the caliber of the White House dinners that (in a classic patriarchal holdover) as First Lady, she is supposed to be overseeing. On the romantic, heroic, character of a political candidate, based on his and his public-relations firm’s stories about his upbringing, see Saturday’s post. A public figure with charm, good-storytelling skills, and heroic background (i.e. someone I’d like to have as a dinner guest) ≠ good political commitments, political sense, conviction, or administrative skills. Our judgments about a candidate based on video clips, numerous though they be, are fairly undependable. NB: Perhaps this post is ridiculously obvious. But before November 2008, how many times did you think that Obama’s polished, charming, cosmopolitan self would guarantee us much more progressive politics than Bush’s crude, fratboyish presence?